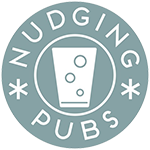 Last month, we launched an online survey to find out what customers think of pubs and bars. We are currently in the process of developing a self-assessment tool for licensed venues, and we wanted to hear from everyone – both drinkers and non-drinkers – about what they think makes a great night out. Over 100 customers participated in the survey, and this article highlights some of our findings. The ratio of drinking to non-drinking participants in the survey was almost equal: 49% of people said they were trying to quit or had quit successfully, and the other 51% were either moderating or not planning to change their drinking. The equal ratio means that the results are representative of several different types of customer, and the viewpoints encompass those of both drinkers and non-drinkers. Our first few questions were drinks-based. 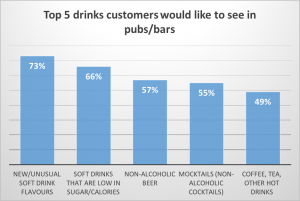 We asked about the range of drinks options people would like to see in a pub or bar, and whether the variety of drinks offered would determine where they decide to go on a night out. For these questions, participants could select more than one option. 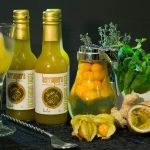 New and unusual soft drink flavours was the most popular choice, with 73% saying they would like to see more of these behind the bar. This was closely followed by low-sugar soft drinks at 66%, with over half of participants saying they would like to increase the availability of non-alcoholic beers too. The responses indicate that these aren’t just wistful desires; for some, lack of variety is a deal-breaker. A clear majority of 57% confirm that the choice of low and no alcohol drinks does influence their decision of which venues to go to. Only 11% say it doesn’t matter at all. This is lower than the percentage of non-drinkers who participated in the survey, suggesting that even regular drinkers care about the choice of low and no alcohol drinks on offer. When asked what they would like to change about pubs and bars, many complained about the sweetness and artificiality of popular soft drinks. A few also suggested other alternatives, like smoothies, cordials, or having tea and coffee available all night. Some suggested changes as simple as including alcohol-free options on menus, or serving soft drinks that look like “grown-up alternatives” rather than like kids’ drinks. The issue of cost rarely makes an appearance in the answers, indicating that most customers would be willing to pay more for a healthier, more adult-feeling soft drink. Our other questions were venue-based. 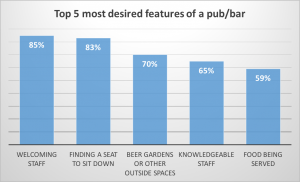 We wanted to find out what people’s ideal pub or bar would look like, and the features it would include. Again, we allowed participants to choose multiple options. A staggering 85% ticked welcoming staff as a feature, with being able to find a seat and having a beer garden not far behind at 83% and 70%. 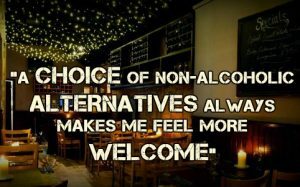 Appreciation for a wide-ranging, inclusive selection of drinks also reappeared, with one customer saying that “apart from the obvious aesthetic things like good acoustics and kind lighting, a choice of non-alcoholic alternatives always makes me feel more welcome”. 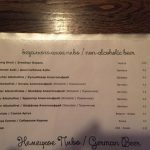 What’s in an (alcohol-free) name?